2.Heat a little oil in a pan and add green chillies without chopping and fry for 2 mins.Then add tamarind and over and let it cook for some time. 3. 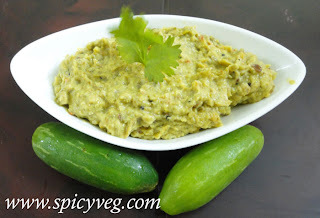 Transfer Tindora,green chillies and tamarind to a mixer jar and blend them to a coarse paste. 4.Check and adjust the salt. 5.Heat oil in a pan add red chilli, mustard seeds, cumin seeds and let them splutter and add chana dal, urad dal and curry leaves and remove from fire. 6.Add this tempering to the tindora mixture. 7.Add coriander leaves to the mixture and serve with hot plain rice.